Women often look forward to menopause with a mix of anticipation and dread. On the one hand, not having their period anymore may be a welcome relief. However, the thought of hot flashes and other symptoms and changes that accompany this phase of life can seem daunting. With many of our patients, we’ve found the hype surrounding menopause often makes the anticipation worse than the actual experience. Many of the changes women experience as they enter menopause are gradual. You are clinically in menopause once you have not had a period for 12 months. But it’s not like flipping a switch; it can take anywhere from several years to a decade for that to occur. During that period, which we call perimenopause, your body is experiencing gradual changes. For example, it’s important to know that missing a period or two does not mean you are in menopause. Even if your periods become irregular or if you don’t have one for a few months, you may still be fertile and able to conceive until you are truly in menopause. People also have misperceptions about hot flashes, perhaps one of the most talked about symptoms of perimenopause. But not all women experience hot flashes as they enter menopause and those who do don’t all have the same experience. Hot flashes can range from mild to moderate or severe. Some women have a few episodes and others have them more frequently. Others may experience them only at night. Hot flashes are not the only symptom of menopause. There is a wide range of changes and symptoms women may experience, including sleep disruption, irritability, mood swings, changes to skin and hair, weight gain, vaginal dryness and incontinence. The majority of related symptoms are the result of decreased estrogen production during the perimenopausal and menopausal years. The good news is there are ways we can correct or minimize the severity of many of these symptoms. Treatment options vary based on specific symptoms. Hormone replacement therapy may help alleviate several symptoms, but many women are reluctant to take them. 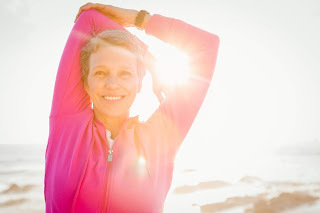 There are certainly women for whom hormone replacement is not recommended due to other health issues, such as high cholesterol or blood pressure, obesity, breast cancer and other conditions. For generally healthy women, however, hormone replacement can help ease the transition to menopause. Talk to your health care provider about your specific symptoms. It’s often helpful to jot down notes about what you are experiencing, from trouble sleeping to hot flashes and other symptoms, to track frequency and severity. This can help us come up with strategies that will work best for your individual situation. If you are beginning to experience signs of menopause, or are struggling with some of the changes, schedule an appointment and we’ll work with you to address any concerns.